"Going Little Goes a Long Way"
LITTLE is a lively comedy about a successful businesswoman, Jordan, who gets turned into her 13-year-old self and must learn how to navigate her present predicament while trying not to repeat the mistakes in her past that made her callous toward other people. LITTLE is structured very well and has several heartwarming, redemptive moments, with Christian, biblical references, but it’s clouded by lots of foul language, significant sexual innuendo, and some alcohol and drug references. 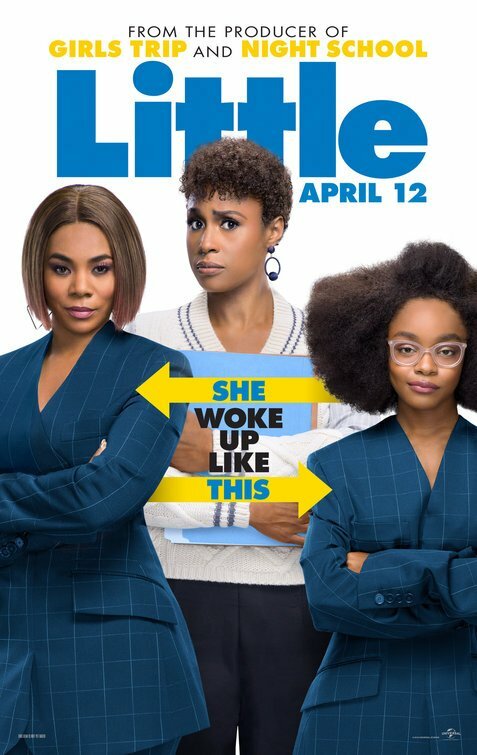 LITTLE is a lively comedy about a successful businesswoman, Jordan, who gets turned into her 13-year-old self and must learn how to navigate her present predicament while trying not to repeat the mistakes in her past that made her callous toward other people. LITTLE has some strong positive elements but they’re clouded by some negative content. The movie opens with a flashback to 1993. At a middle school assembly, 13-years-old Jordan Sanders is onstage demonstrating a science project about the laws of physics. Her demonstration goes awry when a school bully knocks her down and humiliates her in front of their peers. Cut to the present day. Jordan is a high-paid business woman living in Atlanta with her own successful tech company, JSI. Jordan’s assistant, April, is a creative hopeful with a bit of a timid nature when it comes to standing up to her boss. A JSI employee’s niece notices Jordan is rude to those around her and takes out a magic wand to wish she was a “little” kid. The next morning, Jordan wakes up and begins her normal routine only to realize she’s now 13-years-old. April comes by the apartment and learns her boss is now a child. April promises to help Jordan if she’s awarded a promotion. Jordan reluctantly agrees. After a neighbor calls, an officer from Child Protection Service comes by to check in on the situation. Jordan is forced to go back to her old middle school and face the same type of children from her past, only years later. Meanwhile, April tries to run JSI with Jordan coaching her via the phone. The stakes are high at JSI as Jordan’s biggest client plans to leave if he doesn’t see a promising project within two days. Back at middle school, Jordan’s bossy nature doesn’t result in any popularity but rather earns her a seat at the “friend zone” table where she meets other misfit students. Jordan’s new pals audition for the school’s spirit week talent show. They only get added to the show by the school bully, Jasmine, so that others can make fun of them. At JSI, April is weary to share about an app idea called “Discover Eyes,” an interactive game that makes the world creative and fun as if from the perspective of a child. A coworker agrees with her that it is indeed a good idea. When teenage Jordan sees how April is handling things at the office, she explodes and gets angry at her. April’s important business pitch and the spirit week rally are scheduled to happen at the same time. Will teenage Jordan and April be able to put aside their frustrations to help one another in their time of need? LITTLE is almost a BEAUTY AND THE BEAST meets DEVIL WEARS PRADA story, where the mean boss must learn to treat others with respect by becoming a different version of herself. LITTLE has many heartwarming moments surrounding the character development. Even better, it displays a redemptive ending where Jordan learns to be kind to others and not run away from her past. Similarly, April learns how to assert her ideas and recognize her own talent. LITTLE has fun costumes and a great story structure that includes some nice character transformations. It has a positive view of a man wanting to become a father and of people wanting more responsibility in a relationship while encouraging their significant others to do well. LITTLE has some Christian themes of forgiveness, sacrifice and reconciliation, plus moments where the lead character quotes from the Bible and asks God for a sign. However, the movie’s ending is clouded by a Romantic, politically correct message to just “be yourself.” LITTLE also has lots of foul language, significant sexual innuendo, a couple homosexual references, and some alcohol and drug references. MOVIEGUIDE® advises extreme caution. LITTLE is a lively comedy about a successful business woman, Jordan, who gets turned into her 13-year-old self. With the help of April, her assistant, Jordan must navigate her current situation while trying not to repeat the mistakes in her past that made her callous toward others. Meanwhile, April must represent Jordan to pitch a new product to a client. Can Jordan and April put aside their frustrations to help one another? LITTLE has some fun costumes and a great story structure with nice character transformations. In the story, a man wants to become a father and people encourage their friends to do well. LITTLE has some Christian themes of forgiveness, sacrifice and reconciliation, plus moments where the lead character quotes from the Bible and asks God for a sign. She learns to be kind to others and not to run away from her past. The ending, however, is clouded by a Romantic, politically correct message to just “be yourself.” LITTLE also has lots of foul language, significant sexual innuendo, and some alcohol and drug references. MOVIEGUIDE® advises extreme caution.